1. On May 20-24, fierce fighting took place between the Lebanese army and a terrorist organization calling itself "Fath al-Islam”. The clashes occurred in the northern Lebanese city of Tripoli and in Nahr al-Bared, a refugee camp located on the city’s outskirts. 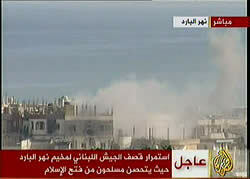 Some 80 people were killed in the clashes, including about 25 Fath al-Islam operatives and about 30 Lebanese soldiers. The fighting lasted for several days and was followed by a relative calm occasionally broken by exchanges of fire between the two sides. The affair is not over yet. 2. Fath al-Islam (i.e., "The Conquest—or Victory—of Islam”) is a terrorist organization with several hundreds of operatives. The organization started its activity under the guise of a pro-Syrian Palestinian organization of Fatah secessionists (the organization of Abu Moussa) and is an offshoot of Al-Qaeda in Lebanon . Fath al-Islam has its strongholds in the refugee camps in the vicinity of the northern Lebanese city of Tripoli , but it is also present in other locations in Lebanon , mainly in Palestinian refugee camps. The organization is headed by Shaker al-Absi, Jordanian of a Palestinian origin, who fulfilled key positions in the Al-Qaeda organization in Iraq , was involved in terrorism in Jordan , and was held in prison in Syria (see Appendix for details). 3. The intense fighting between the Lebanese army and Fath al-Islam is a new high in a series of sporadic local confrontations that have been taking place in the past year between the Lebanese security forces and global jihad elements which attempt to entrench their hold in Lebanon . In 2006, violent confrontations, albeit on a lesser scale than the current clashes, took place between the Lebanese army and global jihad elements in the vicinity of Beirut and in the Ain al-Hilweh refugee camp, located on the outskirts of the city of Sidon in southern Lebanon . 4. 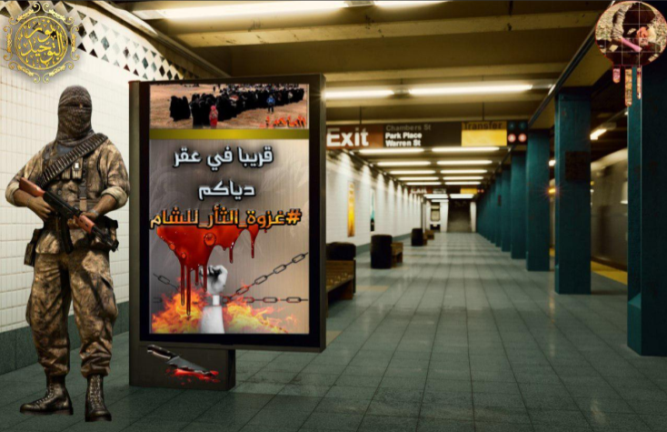 With the broad support of internal Lebanese public opinion (as well as the inter-Arab and international community), the Lebanese government attempts to halt the strengthening of the global jihad elements, but finds subduing them difficult. One of the reasons for that is the Lebanese government’s (long-standing) reluctance to introduce the Lebanese army into the Palestinian refugee camps, where Fath al-Islam and other global jihad elements are free to do almost as they please. A prominent example is the Ain al-Hilweh refugee camp, located in Sidon , which serves as the base of operations of Jund al-Sham —yet another organization belonging to global jihad. 5. The clashes in the Nahr al-Bared refugee camp show once again that the global jihad infrastructure being built in Lebanon is both extensive and deeply-entrenched. 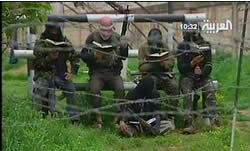 Global jihad operatives in Lebanon (some of them Islamists who come to Lebanon from various countries) undergo training and arm themselves, with the purpose of being used by Al-Qaeda to perpetrate terrorist attacks against Israel and against Western targets in Lebanon and areas of conflict elsewhere. That infrastructure was not significantly damaged as a result of the confrontations taking place in Nahr al-Bared between the Lebanese army and Fath al-Islam. 6. According to Lebanese media reports, the current confrontation broke out on May 19, when a group of terrorist operatives, apparently belonging to Fath al-Islam, robbed a bank in Tripoli . The robbers allegedly found shelter in an apartment in the city of Tripoli . In the morning of May 20, following the robbery, the Lebanese army raided residential buildings in Tripoli whose owners had ties with the organization. 7. The Lebanese army was met with violent resistance by Fath al-Islam operatives who were at the site. At the same time, the organization’s operatives from the Nahr al-Bared refugee camp took control of Lebanese army outposts outside of the refugee camp. Several operatives even managed to join the organization’s operatives in the residential buildings in Tripoli . 8. For several days (May 20-24), intense fighting raged between the Lebanese army and Fath al-Islam terrorists. As the fighting began, the Lebanese army sent reinforcements to Tripoli , surrounded the Nahr al-Bared refugee camp, took positions overlooking the camp, and pounded it with tank and artillery fire. As usual, however, the Lebanese army avoided entering the refugee camp, preferring instead to deal with the Fath al-Islam terrorists from afar (with Fath al-Islam terrorists sniping and shelling the army forces). 9. In the battles, the Lebanese army managed to regain control over the positions seized by Fath al-Islam outside of the Nahr al-Bared camp and destroy some of the organization’s facilities, including the Samed building in the refugee camp, which served as the organization’s training and activity center. According to Lebanese "military sources”, the Lebanese army hit two inflatable boats in which Fath al-Islam terrorists attempted to flee the camp (May 24). After several days of intense fighting, an uneasy truce was reached. 10. So far, some 80 people were killed and over 100 were wounded in the fighting. 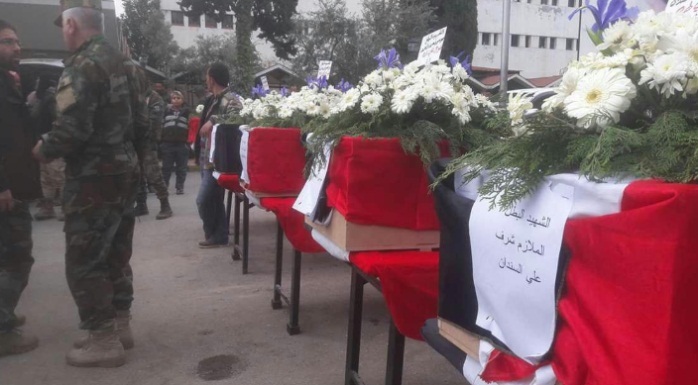 Those killed include some 25 Fath al-Islam operatives, including several senior figures in the organizations. 1 Found on the bodies of some of the casualties were fake Lebanese documents, passports, and non-Lebanese money (33,000 Saudi rials were found on the body of one of the casualties; Al-Safir, May 25). About 30 Lebanese soldiers and dozens of civilians were killed as well. Several thousands of Palestinians had to leave the Nahr al-Bared refugee camp and move to the nearby Badawi camp. Several dozens of the organization’s operatives were arrested by the Lebanese security forces. 11. Backed by a broad-based Lebanese opposition to global jihad, Lebanon ‘s Prime Minister Fouad Siniora stated once again that Lebanon would not yield to terrorism and that he would take all necessary measures to remove the gunmen from the Nahr al-Bared refugee camp. However, Siniora stressed that Lebanon was not interested in a conflict with the Palestinian population, and that such a conflict is something he would not allow. 12. On May 27, the Lebanese government served the Palestinian organizations with a 72-hour ultimatum to reach a "political resolution” with Fath al-Islam. In the Lebanese government’s view, such a demand means the handover of Fath al-Islam terrorists and putting them to trial, and the return of the non-Lebanese gunmen to their countries. We do not know how the Lebanese government is planning to proceed should its demands go unheeded. 13. Using the occasion of the fight against global jihad, the Lebanese government asked the US to provide it with assistance in the form of ammunition and military equipment. The US was quick to acquiesce. According to reports by news agencies and the Lebanese media, three American transport planes landed in the Beirut airport on May 25, with more planes on the way. The media reported that the planes brought arms, ammunition, spare parts, and military equipment (such as vests, helmets, and night vision goggles). 14. In the official announcements it released, Fath al-Islam portrayed the clashes as a war waged by the government of Lebanon ("the tyrants of Lebanon and the army”) against Islam, and threatened that if the Lebanese army continued its "aggressive activities”, the organization would broaden the scope of the clashes and carry out terrorist attacks across Lebanon . Examples of such announcements follow. a. Shaker al-Absi , the leader of Fath al-Islam, said that the Lebanese Sunnis should "be the spearhead in the war against the Jews, the Americans, and their allies” (Al-Jazeera TV, May 26). b. Shihab al-Qaddour (Abu Hureira), the organization’s military commander and Al-Absi’s second-in-command, threatened that should the attacks of the Lebanese army against his organizations continue, "all the fronts would open” and Fath al-Islam would be "willing to blow up any place in Lebanon ”. He said that the organization was capable of "relocating the campaign to any spot in Lebanon ” (Al-Hayat, May 25). c. Fatah al-Islam spokesman Abu Salim Taha described the organization’s activity as self-defense and clarified that the organization’s purpose was to liberate all the holy sites, particularly the Al-Aqsa Mosque, and protect the Sunnis, especially in Lebanon (Al-Jazeera, May 20). 15. In a speech given on "Resistance and Liberation Day” (May 25), Hassan Nasrallah denied any connection between Hezbollah and Fath al-Islam, stressing that Hezbollah was not interested in becoming part of the conflict. In his speech, he warned the Lebanese government against introducing the Lebanese army into the Nahr al-Bared refugee camp, since that could prove detrimental to the Lebanese army and harm the refugees living in the camp. Nasrallah also said he was against the American assistance to Lebanon , claiming it to be meddling in Lebanon ‘s internal affairs and an expression of the Bush regime’s intention to turn Lebanon into a war zone between the US and Al-Qaeda (Al-Manar TV, May 25). 16. The following is a summary of the reactions of other Lebanese senior officials and organizations. a. 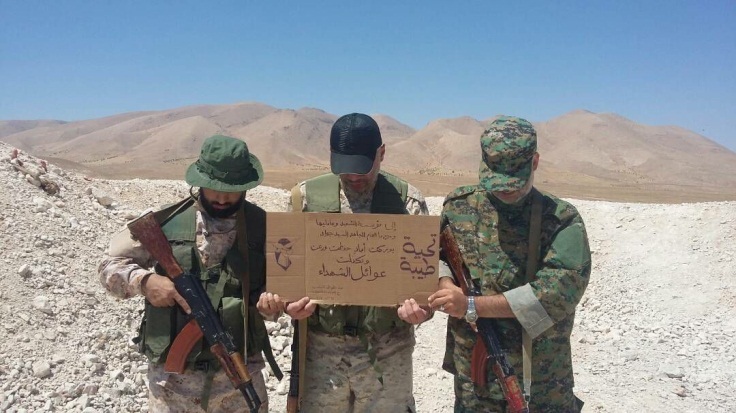 The March 14 Forces, which oppose Syria and Hezbollah, claimed that the fighting broke out on Syria’s command, in protest of the UN’s signing an agreement to create an international tribunal to try the murderers of Hariri (FTV, May 21). Walid Jumblatt, the leader of Lebanon ‘s Druze community, called a press conference in which he accused Bashar Assad of using Fath al-Islam to destroy Lebanon against the background of the progress made in the creation of the international tribunal (Lebanese News Agency, May 22). b. Michel Aoun, Hezbollah’s Christian ally, never missing an opportunity to lash out against the government, accused it of preferring to deal with the issue of Hezbollah’s arms over dealing with threats to Lebanon ‘s security, and called on the government to resign (Al-Hayat, May 21). c. The Amal movement noted that the clashes were damaging Lebanon ‘s stability and internal reconciliation, and expressed their support of the Lebanese army (Lebanese News Agency, May 20). 17. Syrian Foreign Minister Walid Muallem stated that Fath al-Islam was a terrorist organization and part of the Al-Qaeda organization. He said that the organization and its leader had threatened to perpetrate terrorist attacks in Syria , and were wanted by the Syrian security apparatus (AFP, Damascus , May 25). 18. As a rule, the Palestinian terrorist organizations and Palestinian elements in Lebanon made sure to deny having anything to do with Fath al-Islam and to condemn the clashes. At the same time, they set to work with the Lebanese regime in order to calm the situation and prevent further harm to the Palestinian population residing in the Nahr al-Bared refugee camp. 19. Of special note is the Hamas movement, which took advantage of the clashes to make itself appear as the main representative of the Palestinian population in the refugee camps, a role formerly reserved for the PLO and Fatah. Through Osama Hamdan, its representative in Lebanon , Hamas held contacts with the Lebanese government in order to establish a ceasefire and, at the same time, provided humanitarian assistance to the residents of the Nahr al-Bared refugee camp (money, medical supplies, and foodstuffs). 20. Khaled Mash’al, the head of the Hamas Political Bureau, held talks with Lebanon’s Prime Minister and demanded him to take all necessary measures to avoid harming the Palestinians residing in the Nahr al-Bared refugee camp. Hamas’s Information Bureau issued an announcement stating that Lebanon ‘s PM Fouad Siniora was cooperating with Khaled Mash’al, and promised to do whatever it took to protect the Palestinian population. Khaled Mash’al also spoke to the Secretary General of the Arab League and to the Foreign Minister of Saudi Arabia on that issue. Abbas Zaki, the PLO/Fatah representative in Lebanon , as well as other Palestinian representatives, took part in the contacts held with the Lebanese government, without any significant influence. 1. 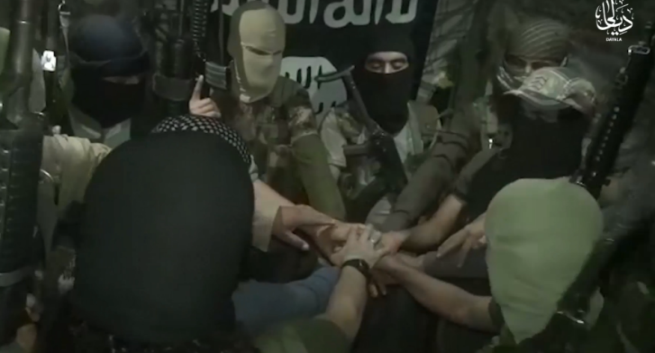 Fath al-Islam was established in the course of the past year by Shaker al-Absi, a senior Al-Qaeda operative. 2 The organization started operating under the cover of Fatah/Abu Moussa (a Palestinian organization that broke away from Fatah during the first Lebanon war with Syria ‘s encouragement and assistance). In November 2006, after conflicts with other organizations, it declared itself to be independent. 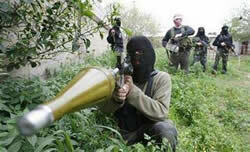 Nowadays, the organization numbers several hundreds of Palestinian operatives and other nationals. 3 Some of them were dispatched from Lebanon to other countries upon the completion of their training. 2. The leader of Fath al-Islam is Shaker Youssef Hassan al-Absi, nicknamed Abu Hussein. Following are some biographic details about him. a. He was born in the Ain al-Sultan refugee camp, located near Jericho , in 1955. Originally from the Hebron district, his family later relocated to Jericho . b. Later, his family moved to the Al-Wahadat refugee camp (near Amman ), where he graduated from high school (1973). He joined the ranks of Palestinian terrorist organizations and moved to Libya . c. In Libya , Shaker al-Absi was trained as a pilot (according to another version, he studied medicine in Algeria and was trained as a pilot in an East European country). He remained in Libya until 1983.
d. In 1983, he joined the pro-Syrian organization of Fatah secessionists, called Fatah/Intifada, headed by Abu Moussa. He moved to Syria , where he lived until 2005. He took part in the activity of the "Western Sector”, the apparatus responsible for perpetrating terrorist attacks in Israel . e. The Syrian defense authorities arrested Shaker al-Absi in 2000. He spent three years in the Syrian prison on charges of attempting to perpetrate a terrorist attack in the Golan Heights and smuggling arms and ammunition to Jordan . Requests made by the Jordanian authorities to extradite him were turned down by the Syrians. f. Shaker al-Absi was released from the Syrian prison in 2003, shortly before the US-led invasion to Iraq . 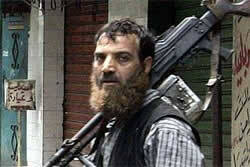 After the fall of Baghdad , he moved to Iraq and fought alongside Islamic groups associated with Al-Qaeda. In Iraq , he came to know the local Al-Qaeda leadership, mainly Abu Mus’ab al-Zarqawi and his chief assistant, Ibrahim Saleh (both were killed by the Americans in 2006). g. In Jordan , Shaker al-Absi was sentenced to death in absentia in 2004. He was charged with involvement in the assassination of American diplomat Lawrence Foley, who worked for the Agency for International Development (USAID) in Jordan (he was murdered on October 28, 2003). h. In November 2005, Shaker al-Absi moved to Lebanon . 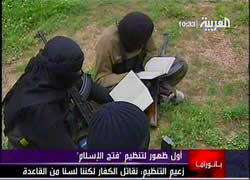 In Fatah/Intifada camps in the Bekaa Valley he trained groups of terrorists who would become Fath al-Islam operatives. Later he moved to the Nahr al-Bared refugee camp, where he currently resides with his wife and children. 3. The military commander and second-in-command of the organization is a Lebanese named Shihab al-Qaddour, alias Abu Hureira. 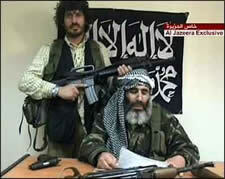 Shihab al-Qaddour, 36, is from the village of Mishmish , in the northern Lebanese district of Akkar (west of Tripoli ). According to Al-Qaddour, he spent five and a half years in the Syrian prison and has extensive combat experience in various regions, including Iraq (Al-Hayat, May 25). 4. Fath al-Islam operatives are located in several sites in northern and central Lebanon , mainly in the Palestinian refugee camps. The center of the organization’s activity is the Nahr al-Bared refugee camp, being the scene of the clashes with the Lebanese army. The organization’s strongholds serve to recruit, sort, and train the hundreds of operatives who joined its ranks (most of them being from outside of Lebanon ). 6. Fath al-Islam is currently in the process of rebuilding its strength in Lebanon . It recruits dozens of foreign operatives and provides them with target-specific training for developing operative-terrorist capabilities, including such capabilities that would allow it to perpetrate terrorist attacks against Israel and the West. The organization expands its presence in Lebanon and, in our assessment, seeks to establish branches in other countries in the Middle East .